What does it mean to embrace the impulse to teach music for ecological literacy? What is it like to theorize eco-literate music pedagogy? What is learned through enacting this pedagogy? How do the impulsion, the theorizing, and the enacting relate to one another? Music education for ecological consciousness is experienced in local places, and this study explores the theory underlying eco-literate music pedagogy in juxtaposition with the author’s personal experiences. The work arrives at a new philosophy for music education: a spiritual praxis rooted in soil communities, one informed by ecology’s intrinsic value for non-human being and musicking. 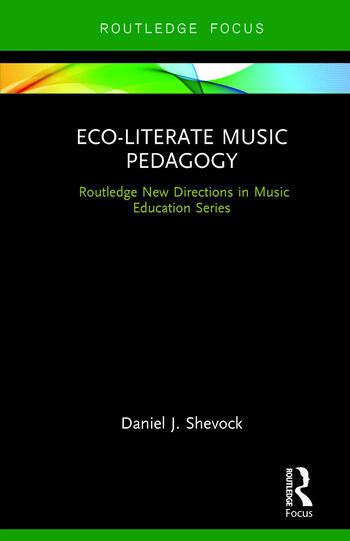 Eco-Literate Music Pedagogy adds to the emerging body of music education literature considering ecological and environmental issues. Daniel J. Shevock is a Lecturer in Music at Pennsylvania State University, Altoona, where he served as Emerging Musical Artist in Residence in Jazz. He taught instrumental and general music in the Pittsburgh Public Schools for eleven years.